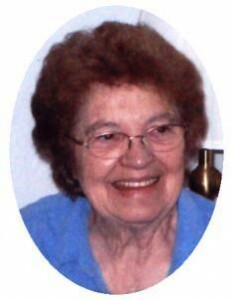 Virginia I. Benson, 77, of N Park Avenue in Waubeka, died February 25, 2014 at Lawlis Family Hospice in Mequon, Wisconsin. She was born December 29, 1936 to Raymond and Irene Dietrich Ryder in Crivitz, Wisconsin. On August 4, 1956 she married Thomas Benson in West Allis, Wisconsin. They moved to Cedar Grove in the 1970’s and have resided in Waubeka for the last 20 years. Her husband Thomas preceded her in death October 16, 2013. Virginia worked for the Allen-Edmonds Shoe Company for over 25 years. She most recently worked as a food demonstrator for Costco in Grafton. She was a loving and caring woman and her grandchildren were very special to her. She enjoyed traveling with her husband and spending time at their trailer at Westward Ho Campground in Glenbeulah, Wisconsin. She is survived by her sons Tom Benson, Jr. of Adell and Tim (Tina) Benson of Port Washington. Further survived by grandchildren Kyle, Tyler, Shain and Jessica, brother William (Jan) Ryder of New Berlin, WI, sisters Marjorie Jennings of Murfreesboro, TN and Marvelyn Roth of Sheboygan, other relatives and friends. She is preceded by her husband Thomas, Sr., a brother Stephen Ryder and a sister Raeann Ryder. Fr. Guy Gurath will officiate funeral services 1 pm Friday, February 28, 2014 at the funeral home. Visitation from 10 am – 1 pm Friday at the funeral home. Interment Waubeka Union Cemetery. Memorials appreciated.